If you’re looking for thrills and adventure near International Drive, look no further than Fun Spot and Magical Midway. 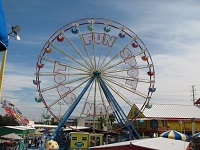 Both parks have been a staple of International Drive entertainment for decades and offer hours of exhilarating rides the whole family will love. Enjoy some good, old-fashioned fun as you play classic arcade games to win prizes and test your bravery on some of Orlando’s most thrilling attractions. Both parks offer day passes as well as an option to pay for individual rides. You’ve probably seen this colorful slingshot rising high above the skyline. For only the bravest thrill seekers out there, this exhilarating ride launches you over 390 feet above Orlando at the force of 3 – 5 G’s. Next to the Slingshot is the Starflyer. More intense than your typical set of amusement park swings, the Starflyer raises you 230 feet above ground and spins you at high speeds, reaching approximately 50 mph. As the name suggests, this ride blasts you high up into the air above the park. Free fall back down for that thrill of weightlessness. Known as Orlando’s first Virtual Reality Coaster, this family-friendly ride is truly one of a kind. Select seats offer a VR headset for a unique roller coaster experience as you soar above Orlando in a quest to defeat the evil robots. Four multi-level tracks let you pick the go-kart racing experience you want. Enjoy a smooth ride on the intermediate track or tackle the advanced tracks that are built for speed with hairpin turns and steep hills for extra thrills. Soar above International Drive on this classic Ferris wheel. Spot your favorite I-Drive attractions, restaurants, your hotel, and even downtown Orlando on a clear day. Ride after dark to enjoy the colorful lights from Fun Spot and other nearby attractions. When booking a hotel for your Orlando getaway, consider Rosen Inn International near all the midway fun. Just minutes from Magical Midway and Fun Spot, Rosen Inn International offers free parking and free Wi-Fi so you can save and enjoy even more fun on your Orlando vacation. Book your stay today by calling 407-996-1600.